Berkeley College joined the community in northern Bergen County as a sponsor of the 6th Annual Susan Zabransky Hughes Memorial 5K Run on April 29, 2017, presented by the HackensackUMC Foundation and the Run for Sue Committee. They were joined by members of CommandCare, a home health agency that partners with the College for access to testing and training facilities, professional development, as well as nursing faculty guidance and assistance through the Berkeley College School of Health Studies. A team of Berkeley College students, faculty and staff competed in the run, held in honor of Susan Zabransky Hughes, who lost her battle with cervical cancer in 2011. Over the past five years, the run has raised more than $2 million to benefit a special oncology suite at the Emergency & Trauma Center at Hackensack University Medical Center in Hackensack, NJ. Proceeds from this year’s run benefit a scholarship to the Seton Hall-Hackensack Meridian School of Medicine, as well as two weeks of camp at Pony Power Therapies in Mahwah, NJ, for patients treated at the Joseph M. Sanzari Children’s Hospital at HackensackUMC. Click here for more information about the 6th Annual Susan Zabransky Hughes Memorial 5K Run. Photo Captions: Top: (Left to right) Megan Zabransky, of Mahwah, cousin of Susan Zabransky, Clinical Liaison; Deirdre Conboy-Mariotti of Dumont, Clinical Manager, and Jean Civil of Wayne, Clinical Liaison, all of CommandCare; Bill and Susan Zabransky, parents of Susan Zabransky Hughes; Michael J. Smith, President of Berkeley College; Julie Cowan of Mahwah, Director of Nursing, and Jennifer Blanchard of Mahwah, Vice President, both of CommandCare; and Ihor S. Sawczuk, MD, President, Hackensack University Medical Center. 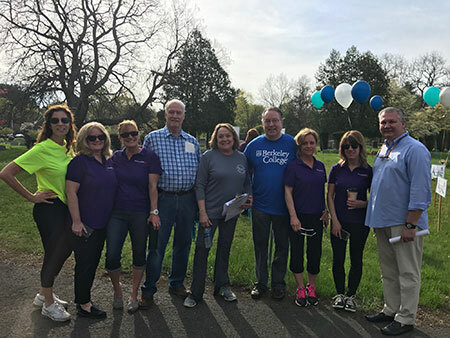 Berkeley College and CommandCare joined the community in northern Bergen County as a sponsor of the 6th Annual Susan Zabransky Hughes Memorial 5K Run on April 29, 2017, presented by the HackensackUMC Foundation and the Run for Sue Committee. 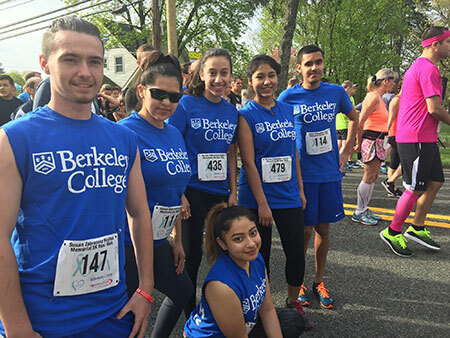 Above: Some students on the Berkeley College team at the start of the 6th Annual Susan Zabransky Hughes Memorial 5K Run, held in Saddle River, NJ, on April 29, 2017. (Standing, left to right): Colin Burke of Teaneck, NJ; Pamela Andrade of North Bergen, NJ; Vanessa Osorio of Wallington, NJ; Melissa Ramirez of Bogota, NJ; and Anthony Argueta of Fairview, NJ, a member of the Berkeley College Men’s Cross Country team, who came in first place. (Lower row): Marilyn Contreras of Passaic, NJ. “It is awe-inspiring to see all these people who not only want to run but who prioritize giving back and want to run for a great cause,” said Megan Zabransky, Clinical Liaison, CommandCare and cousin of Susan Zabransky, during an interview with The Daily Voice about the run. Click here to read The Daily Voice’s story about the Susan Zabransky Hughes Memorial 5K Run.